When the term “graphic novel” first came into vogue in the 1980s, it was seen by many as just a fancy-pants name for comic books — a self-conscious way of bootstrapping a lowly medium into social acceptability. If you told someone at a party that you were reading a graphic novel, it betokened not necessarily that you were serious but that you wanted to be perceived as serious. It was a pose, a dodge, a pretention — no matter that works like Art Spiegelman’s Pulitzer Prize-winning “Maus,” Marjane Satrapi’s “Persepolis,” and Alison Bechdel’s “Fun Home” were and are terrifically rich reads that wouldn’t work as well as they do in any other format (and, yes, I’m a fan of “Fun Home” the Broadway smash). Even Alan Moore, who wrote “Watchmen,” one of the breakthrough graphic novels on the superhero side of the fence, has gone on record as calling the label a “marketing term” — he prefers the simpler “comics.” And that’s understandable: Why not just call a spade a spade, no matter that (or even because) your mom and every one of your elementary school teachers reviled it? And yet. As someone who had only a passing interest in the Marvel/DC wing of the building as a kid but whose teenage mind was blown by the appearance of “Zap Comix,” R. Crumb, and the explosion of the illustrated underground, I’ve always found the term “graphic novel” useful, if slightly twee in the wrong hands. There is, in fact, a distinction between the mainstream comics publishing industry, which puts out generally fantasy-based stories that hew to a fairly rigid narrative formula in serialized form on a regularly scheduled basis, and one-shot books that express more personal visions, whether those visions are artistic, literary, somber, or silly. There’s also an immense space in between those two poles. Taking stock of the state of illustrated narrative in 2017, one is struck by the many flavors and styles. There are personal sagas that are the children and grandchildren of “Maus,” adaptations of literary classics (a format given new life by Crumb’s meticulous 2009 version of the Book of Genesis), international political reportage, biographies of great men and women, illuminated histories, slacker farces, and a lot of work that simply can’t be categorized. And, yes, a handful of superhero riffs that play with and deconstruct the old men-in-tights formulas. Some of them are even from Marvel and DC. You want a place to start? Here are some of the newer titles and noteworthy reissues I’ve been soaking in lately. “Imagine Wanting Only This,” by Kristen Radtke (Pantheon), and “Everything Is Flammable,” by Gabrielle Bell (Uncivilized Books). These two personal histories by women artists show how flexible the sub-genre can get. “Flammable” details Bell’s relationship with her mother, a helpless ex-hippie who lives off the grid and who becomes, in a real sense, her daughter’s child; the style is cartoony yet controlled, six tight panels per page that try to contain the messy emotions within. “Imagine” is much more ambitious. Radtke’s deceptively clean drawing style pulls together a wide-ranging memory play of wanderlust that mourns beloved relatives gone too soon, seeks out ruined places as paradoxical proof of life, and commemorates forgotten disasters of the past and environmental cataclysms to come. Radtke’s writing can sometimes get purple, but her artwork and gift for narrative make connections that leave a reader breathless. “Japanese Notebooks: A Journey to the Empire of Signs,” Igort (Chronicle Books). Like a lot of impressionable Westerners, Igort — born Igort Tuveri in Sardinia — developed a passion for Japanese culture. Unlike most, he lived in Japan for years, creating manga for the national comics industry. “Notebooks” is his reminiscence of that time: Drawn with precise yet densely lavish style, it balances comic interludes, stranger-in-a-strange-land parables, and side essays on notable writers, filmmakers, and madmen. It’s an almost overpoweringly lush book that manages to simultaneously romanticize a foreign culture and lampoon that romanticization. “Songy of Paradise,” Gary Panter (Fantagraphics). More of an illuminated portfolio than a comic, really, this years-in-the-making project from art-comix legend (and “Pee-wee’s Playhouse” designer) Panter puts John Milton’s “Paradise Regained” through a scratchy, surreal mindwarp. With Panter’s hillbilly hero, Songy, standing in for Jesus in the wilderness, the book is short in pages and large of format, with visuals that progress through the temptations from punkish to psychedelic. The final panels are a majestic fusion of Hieronymus Bosch and San Francisco poster artist and “Zap” mainstay Rick Griffin: obsessive mysticism on a grand scale. V. 1,” John Allison (BOOM! Box). 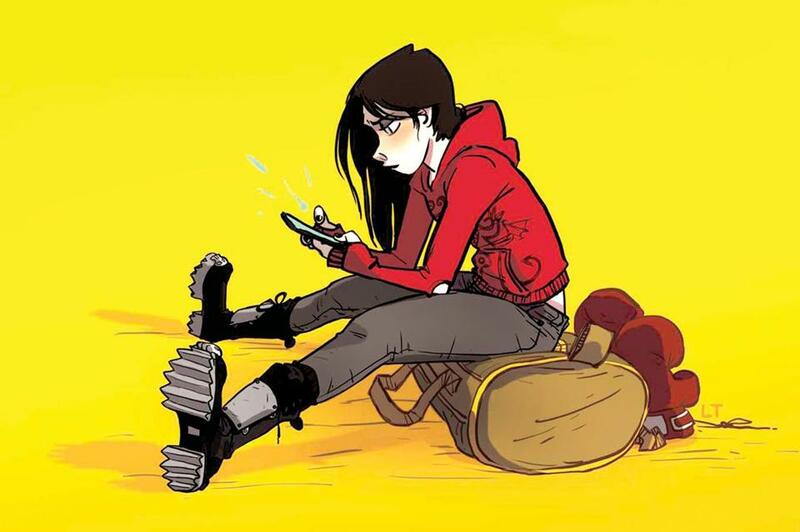 A hardcover collection of the first eight issues of “Giant Days,” a puckishly hilarious comic about the misadventures of three British university women, naive Daisy, drama-magnet Esther, and pragmatic grouch Susan. It’s goofy and smart and resolutely unserious, rather like the late, lamented “Scott Pilgrim” comics but without the flights of fantasy. Allison gives the dialogue a nice topspin, but I wish they hadn’t switched out artist Lissa Treiman for Max Sarin after issue #6 — they both draw well but Treiman draws funnier. “Solid State,” Jonathan Coulton, Matt Fraction, Albert Monteys (Image Comics). Hard to describe this one, set in both an apocalyptic future run by a Google-like corporation and in a present day that may have led to that future. A schnook named Bob is at the center of each narrative, like a hapless hero from an old Firesign Theatre comedy record. Conceived by singer-songwriter Coulton as a side project to his latest album, it’s co-written by Fraction and drawn with crisp dystopian brio by Monteys. I’m still not sure what’s happening in “Solid State,” but I’m having a great time figuring it out. The British Evans has logged much volunteer time in the refugee camps of Calais, France, and her encounters with homeless Syrians and helpful or heartless Europeans are illustrated with a scribbly empathy. You’re so deeply drawn into these people’s stories — the deplored men, women, and children of the new diaspora — that you only notice Evans’s genius for layout on a second visit. “The Unbeatable Squirrel Girl,” Ryan North and Erica Henderson (Marvel). A blat of comic-book weirdness that somehow escaped from the Marvel factory, this series takes a secondary character who debuted in a 1991 “Marvel Super-Heroes” comic and lets her run wild. Squirrel Girl is a bushy-tailed, buck-toothed sort-of superhero who battles famous supervillains, mostly by using logic to just talk them off the ledge of their heavily italicized super-aggression. Available as stand-alone comics and in paperback collections, this is cheeky and also a little nuts. “Boundless,” Jillian Tamaki (Drawn & Quarterly). Nine short stories, each oblique yet memorable, each illustrated by the gifted Tamaki in a different style. The subjects include incredible shrinking women, mythical cult films, an addictive music track that appears on the Internet one day, and bedbugs as a manifestation of adultery-guilt. This is spooky stuff; like the best visual storytellers, Tamaki has the knack of giving us just enough visual and narrative information to hint at much larger mysteries while leaving them mostly unsolved.